Join us each August in North-East Ohio for the worlds largest WWII living history event. 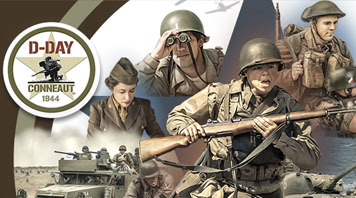 See over 1,700 reenactors from around the world help us tell the story of the men and women and families that made up "The Greatest Generation". Click below for schedule and event information. D-Day Ohio, Inc. is the 501(c)(3) company that hosts D-Day Conneaut each year. Since 1999, this historical reenactment of the events surrounding the Allied landings in Normandy France has thrilled thousands of spectators. Learn more about our mission, our vision, and our history. Help and Support Back the attack! Back the attack and join the ranks by helping to support D-Day Conneaut by volunteering your time and/or with a generous donation. Just like the Army, there are plenty of jobs to go around. Help is needed year round. All levels of volunteering and donations welcome. "Uncle Sam"... and D-Day Conneaut Needs you! See what's new and exciting. Event Artwork View and purchase prints of the and past years event artwork. This year's art created by our staff artist Wayne Heim. Watch for this artwork to be features on our T-shirts and posters. View/Purchase Browse and purchase one-of-a-kind photos from D-Day Conneaut. Browse our collection of photographs captured by our staff and donated by the public from current and past years. 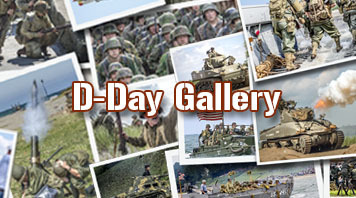 Support D-Day by purchasing one(ore more) of our professional images. PX - Store Show the world your love for history and D-Day Conneaut. 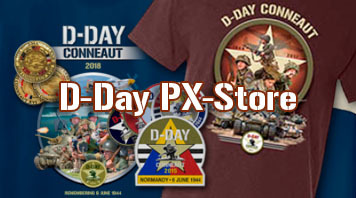 Visit our online D-Day PX store to purchase D-Day swag and merchandise to support this great cause and help keep history alive. Choose from t-shirts, hats, pins, patches and more. D-Day Ohio Museum Come visit the North Coast WWII History Museum. 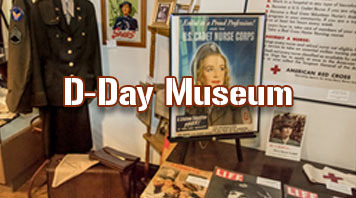 The North Coast WWII History Museum features regional memorabilia and exhibits that shine a light on the life and history of those who served at home and abroad during World War II. D-Day Conneaut is . Reenactor Registration opens May 8th. Be sure to register early. Registration fills up very quickly! Copyright D-Day Ohio, Inc. © . All rights reserved.